This article is about the country. For other uses, see Albania (disambiguation). Albania (/ælˈbeɪniə, ɔːl-/ ( listen) a(w)l-BAY-nee-ə; Albanian: Shqipëri or Shqipëria; Gheg Albanian: Shqipni or Shqipnia also Shqypni or Shqypnia), officially the Republic of Albania (Albanian: Republika e Shqipërisë, pronounced [ɾɛpuˈblika ɛ ��cipəˈɾiːsə]), is a country in Southeast Europe on the Adriatic and Ionian Sea within the Mediterranean Sea. It shares land borders with Montenegro to the northwest, Kosovo[a] to the northeast, North Macedonia to the east, Greece to the south and a maritime border with Italy to the west. Politically, the country is a unitary parliamentary constitutional republic and developing country with an upper-middle income economy dominated by the tertiary sector followed by the secondary and primary sector. It went through a process of transition, following the end of communism in 1990, from a centralized to a market-based economy. It also provides universal health care and free primary and secondary education to its citizens. The term Albania is the medieval Latin name of the country. It may be derived from the Illyrian tribe of Albani (Albanian: Albanët) recorded by Ptolemy, the geographer and astronomer from Alexandria, who drafted a map in 150 AD, which shows the city of Albanopolis located northeast of the city of Durrës. The term may have a continuation in the name of a medieval settlement called Albanon or Arbanon, although it is not certain that this was the same place. In his history written in the 10th century, the Byzantine historian Michael Attaliates was the first to refer to Albanoi as having taken part in a revolt against Constantinople in 1043 and to the Arbanitai as subjects of the Duke of Dyrrachium. During the Middle Ages, the Albanians called their country Arbëri or Arbëni and referred to themselves as Arbëreshë or Arbëneshë. Nowadays, Albanians call their country Shqipëri or Shqipëria. As early as the 17th century the placename Shqipëria and the ethnic demonym Shqiptarë gradually replaced Arbëria and Arbëresh. The two terms are popularly interpreted as "Land of the Eagles" and "Children of the Eagles". Several Bronze Age artefacts from tumulus burials have been unearthed in central and southern Albania that show close connection with sites in south-western Macedonia and Lefkada, Greece. Archaeologists have come to the conclusion that these regions were inhabited from the middle of the third millennium BC by Indo-European people who spoke a Proto-Greek language. A part of this population later moved to Mycenae around 1600 BC and founded the Mycenaean civilisation there. In ancient times, the territory of modern Albania was mainly inhabited by a number of Illyrian tribes. The Illyrian tribes never collectively regarded themselves as 'Illyrians', and it is unlikely that they used any collective nomenclature for themselves. The name Illyrians seems to be the name applied to a specific Illyrian tribe, which was the first to come in contact with the ancient Greeks during the Bronze Age, causing the name Illyrians to be applied pars pro toto to all people of similar language and customs. The territory known as Illyria corresponded roughly to the area east of the Adriatic sea, extending in the south to the mouth of the Vjosë river. The first account of the Illyrian groups comes from Periplus of the Euxine Sea, an ancient Greek text written in the middle of the 4th century BC. 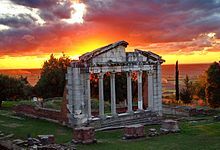 The south was inhabited by the Greek tribe of the Chaonians, whose capital was at Phoenice, while numerous colonies, such as Apollonia, Epidamnos and Amantia, were established by Greek city-states on the coast by the 7th century BC. The west was inhabited by the Thracian tribe of the Bryges. The Illyrian tribe of the Ardiaei centered in Montenegro ruled over much of nowadays Albania. The Ardiaean Kingdom reached its greatest extent under Agron, son of Pleuratus II. Agron extended his rule over other neighboring tribes as well. After Agron's death in 230 BC, his wife Teuta inherited the Ardiaean kingdom. Teuta's forces extended their operations further southward into the Ionian Sea. In 229 BC, Rome declared war on the kingdom for extensively plundering Roman ships. The war ended in Illyrian defeat in 227 BC. Teuta was eventually succeeded by Gentius in 181 BC. Gentius clashed with the Romans in 168 BC, initiating the Third Illyrian War. The conflict resulted in Roman conquest of the region by 167 BC. After that the Roman split the region into three administrative divisions. After the Roman Empire was divided into East and West in the 4th century, the territory of Albania remained within the Eastern Roman Empire. In the centuries that followed, the Balkan Peninsula suffered from the Barbarian invasions. The Illyrians are mentioned for the last time in a text from the 7th century. Towards the end of the 12th and beginning of the 13th centuries, Serbs and Venetians started to take possession over the territory. The ethnogenesis of the Albanians is uncertain however the first undisputed mention of Albanians dates back in historical records from 1079 or 1080 in a work by Michael Attaliates, who referred to the Albanoi as having taken part in a revolt against Constantinople. At this point the Albanians were fully christianized. 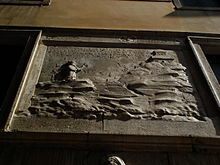 A relief of the Scuola degli Albanesi commemorating the Siege of Shkodra. It illustrates Sultan Mehmet II laying siege to the Albanian town of Scutari then part of Venetian Empire. The first semi-autonomous Albanian polity was formed in 1190, when archon Progon of Kruja established the Principality of Arbanon with the capital in Krujë within the Byzantine Empire. Progon, was succeeded by his sons Gjin and Dhimitri, the latter which attained the height of the realm. Following the death of Dhimiter, the last member of the Progon family, the principality came under the Albanian-Greek Gregory Kamonas and later Golem of Kruja. In the 13th century, the principality was dissolved. Arbanon is considered to be the first sketch of an Albanian state, that retained a semi-autonomous status as the western extremity of the Byzantine Empire, under the Byzantine Doukai of Epirus or Laskarids of Nicaea. Few years after the dissolution of Arbanon, Charles of Anjou concluded an agreement with the Albanian rulers, promising to protect them and their ancient liberties. In 1272, he established the Kingdom of Albania and conquered regions back from the Despotate of Epirus. The kingdom claimed all of central Albania territory from Dyrrhachium along the Adriatic Sea coast down to Butrint. A catholic political structure was a basis for the papal plans of spreading Catholicism in the Balkan Peninsula. This plan found also the support of Helen of Anjou, a cousin of Charles of Anjou, who was at that time ruling territories in North Albania. Around 30 Catholic churches and monasteries were built during her rule mainly in Northern Albania. Internal power struggles within the Byzantine Empire in the fourteenth century, enabled Serbs' most powerful medieval ruler, Stefan Dusan, to establish a short-lived empire that included all of Albania except Durrës. In 1367, various Albanian rulers established the Despotate of Arta. During that time, several Albanian principalities were created, most notable amongst them the Balsha, Thopia, Kastrioti, Muzaka and Arianiti. 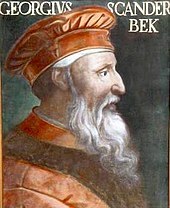 In the first half of the 14th century, the Ottoman Empire invaded most of Albania and the League of Lezhë was held under Skanderbeg as a ruler, who became the national hero of the Albanian medieval history. After serving the Ottoman Empire for nearly 20 years, Gjergj Kastrioti Skanderbeg deserted and began a rebellion against the empire that halted Ottoman advance into Europe for 25 years. The Ottoman invasion of the territory of Albania marked a new era in its history and introduced enormous changes in the political and cultural environment of the area. The Ottomans erected their garrisons across the south of Albania in 1415 and occupied the majority in 1431 although they reached Albanian coast for first time at 1385. Upon their arrival, Islam was introduced in the country as a second religion resulting a massive emigration of Christian Albanians to other Christian European countries such as the Arbëreshë to Italy while Muslim Albanians gradually settled to Turkey and other part of the Ottoman Empire such as Algeria, Egypt and Iraq. In 1443, a great and longstanding revolt broke out under the lead of Gjergj Kastrioti Skanderbeg that lasted until 1479, many times defeating major Ottoman armies led by Murad II and Mehmed II. Skanderbeg united initially the princes of Albania and later on established a centralized authority over most of the non-conquered territories becoming the ruling Lord of Albania. Skanderbeg pursued relentlessly but rather unsuccessfully to create a European coalition against the Ottomans. He thwarted every attempt by the Ottomans to regain Albania which they envisioned as a springboard for the invasion of Italy and Western Europe. His unequal fight against the mightiest power of the time, won the esteem of Europe as well as some financial and military aid from Naples, Venice, Sicily and the Papacy. When the Ottomans were gaining a firm foothold in the region, Albanian towns were organised into four principal sanjaks. The government fostered trade by settling a sizeable Jewish colony of refugees fleeing persecution in Spain. The city of Vlorë saw passing through its ports imported merchandise from Europe such as velvets, cotton goods, mohairs, carpets, spices and leather from Bursa and Constantinople. Some citizens of Vlorë even had business associates throughout Europe. As Muslims, some Albanians attained important political and military positions within the empire and culturally contributed to the wider Muslim world. Enjoying this privileged position, Muslim Albanians held various high administrative positions with over two dozen Albanian Grand Viziers among others Köprülü Mehmed Pasha, Köprülü Fazıl Ahmed and Muhammad Ali Pasha. The most significant impact on the Albanians was the gradual Islamisation process of a large majority of the population, although it became widespread only in the 17th century. The process was an incremental one, commencing from the arrival of the Ottomans. Timar holders, the bedrock of early Ottoman control in Southeast Europe, were not necessarily converts to Islam, and occasionally rebelled, with the most famous of these being Skanderbeg. Mainly Catholic Albanians converted in the 17th century, while the Orthodox Albanians followed suit mainly in the following century. Initially confined to the main city centres of Elbasan and Shkodër, by this period the countryside was also embracing the new religion. The motives for conversion according to some scholars were diverse, depending on the context. The lack of source material does not help when investigating such issues. Naum Veqilharxhi was among the most important figures of the early National Renaissance. The origins of the Albanian Renaissance can be traced back to around the 19th century that was a very difficult period for Albania. During the period, the modern culture of Albania flourished especially in literature and art as well inspired by romanticism and enlightenment. The victory of Russia over the Ottoman Empire following the Russian-Ottoman War resulted the execution of the Treaty of San Stefano that overlooked to assign Albanian-populated regions to the Slavic neighbors. The United Kingdom as well as Austria-Hungary consequently, blocked the arrangement and caused the Treaty of Berlin. At this point, Albanians started to organize themselves with the aim to protect and unite the Albanian-populated regions into a unitary nation. This led to the formation of the League of Prizren in the old town of Prizren. The Albanian-Romanian feminist, Dora d'Istria, was the main advocate in Europe for the Albanian cause. At first the Ottoman authorities supported the League, whose initial position was based on the religious solidarity of Muslim landlords and people connected with the Ottoman administration. The Ottomans favoured and protected the Muslim solidarity and called for defense of Muslim lands, including present-day Bosnia and Herzegovina. This was the reason for naming the league The Committee of the Real Muslims. The league issued a decree known as Kararname that contained a proclamation that the people from northern Albania, Epirus and Bosnia are willing to defend the territorial integrity of the Ottoman Empire by all possible means against the troops of the kingdoms of Bulgaria, Serbia and Montenegro. However, it was signed by 47 Muslim deputies of the league on 18 June 1878. Approximately 300 Muslims participated in the assembly, including delegates from Bosnia and mutasarrif of the Sanjak of Prizren as representatives of the central authorities and no delegates from Vilayet of Scutari. [check quotation syntax] The Ottomans cancelled their support when the league, under the influence of Abdyl Bey Frashëri, became focused on working toward the Albanian autonomy and requested merging of four Ottoman vilayets, which included Kosovo, Scutari, Monastir and Ioannina into a new vilayet within the empire, the Albanian Vilayet. The league used military force to prevent the annexing areas of Plav and Gusinje assigned to Montenegro by the Congress of Berlin. After several successful battles with Montenegrin troops such as in Novsice, under the pressure of the great powers, the league was forced to retreat from their contested regions of Plav and Gusinje and later on, the league was defeated by the Ottoman army sent by the Sultan. The official flag of Independent Albania from 1912 to 1914. The independence of Albania from the Ottoman Empire was proclaimed on 28 November 1912 by Ismail Qemali in Vlorë. Immediately after, the leaders of the Assembly of Vlorë established the senate as well as the first government of the country on 4 December 1912 that consisted of only ten members. The country's independence was recognized by the Conference of London on 29 July 1913. The treaty delineated the borders of the country and its neighbors leaving many ethnic Albanians outside Albania. This population was largely divided between Montenegro and Serbia in the north and east and Greece in the south. Headquartered in Vlorë, the International Commission of Control was established on 15 October 1913 to take care of the administration of newly established Albania, until its own political institutions were in order. The International Gendarmerie was established as the first law enforcement agency of the Principality of Albania. In November, the first gendarmerie members arrived in the country. Prince of Albania Wilhelm of Wied (Princ Vilhelm Vidi) was selected as the first prince of the principality. On 7 March, he arrived in the provisional capital of Durrës and started to organise his government, appointing Turhan Pasha Përmeti to form the first Albanian cabinet. The official flag of the autonomous Albanian Republic of Korçë that was supported by French forces. In February 1914, the Autonomous Republic of Northern Epirus was proclaimed in Gjirokastër by the local Greek population against incorporation to Albania. This initiative was short lived and in 1921, the southern provinces were finally incorporated to the Albanian Principality. Meanwhile, the revolt of Albanian peasants against the new Albanian regime erupted under the leadership of the group of Muslim clerics gathered around Essad Pasha Toptani, who proclaimed himself the savior of Albania and Islam. In order to gain support of the Mirdita Catholic volunteers from the northern part of Albania, Prince Wied appointed their leader, Prênk Bibë Doda, to be the foreign minister of the Principality of Albania. In May and June 1914, the International Gendarmerie was joined by Isa Boletini and his men, mostly from Kosovo, and northern Mirdita Catholics, were defeated by the rebels who captured most of Central Albania by the end of August 1914. The regime of Prince Wied collapsed and later he left the country on 3 September 1914. Zog I of Albania with Italian Foreign Minister, Galeazzo Ciano in 1937. Following the end of the government of Fan Noli, the parliament adopted a new constitution and proclaimed the country as a parliamentary republic in which Zog I of Albania served as the head of state for a seven years term. Immediately after, Tirana was endorsed officially as the country's permanent capital. The politics of Zogu was authoritarian and conservative with the primary aim of which was the maintenance of stability and order. He was forced to adopt a policy of cooperation with Italy where a pact had been signed between both countries, whereby Italy gained a monopoly on shipping and trade concessions. In 1928, the country was eventually replaced by another monarchy with a strong support by the fascist regime of Italy however, both maintained close relations until the Italian invasion of the country. Zogu remained a conservative but initiated reforms and placed great emphasis on the development of infrastructure. In an attempt at social modernization, the custom of adding one's region to one's name was dropped. He also made donations of land to international organisations for the building of schools and hospitals. The armed forces were trained and supervised by instructors from Italy, as a counterweight, he kept British officers in the Gendarmerie despite strong Italian pressure to remove them. Portrait of a Jewish family in Kavajë. During the Holocaust, predominantly Muslim Albanians saved almost 2000 Jews from deportation to the concentration camps during World War II. After being militarily occupied by Italy from 1939 until 1943, the Kingdom of Albania was a protectorate and a dependency of the Kingdom of Italy governed by Victor Emmanuel III and his government. In October 1940, Albania served as a staging ground for an unsuccessful Italian invasion of Greece. A counterattack resulted in a sizable portion of southern Albania coming under Greek military control until April 1941 when Greece capitulated during the German invasion. In April 1941, territories of Yugoslavia with substantial Albanian population were annexed to Albania inclusively western Macedonia, a strip of eastern Montenegro, the town of Tutin in central Serbia and most of Kosovo[a]. Germans started to occupy the country in September 1943 subsequently announced that they would recognize the independence of a neutral Albania and set about organizing a new government, military and law enforcement. Balli Kombëtar, which had fought against Italy, formed a neutral government and side by side with the Germans fought against the communist-led National Liberation Movement of Albania. During the last years of the war, the country fell into a civil war-like state between the communists and nationalists. The communist however defeated the last anti-communist forces in the south in 1944. Before the end of November, the main German troops had withdrawn from Tirana, and the communists took control by attacking it. The partisans entirely liberated the country from German occupation on 29 November 1944. A provisional government, which the communists had formed at Berat in October, administered Albania with Enver Hoxha as the head of government. By the end of the Second World War, the main military and political force of the nation, the Communist party sent forces to northern Albania against the nationalists to eliminate its rivals. They faced open resistance in Nikaj-Mërtur, Dukagjin and Kelmend led by Prek Cali. On 15 January 1945, a clash took place between partisans of the first Brigade and nationalist forces at the Tamara Bridge, resulting in the defeat of the nationalist forces. About 150 Kelmendi[page needed] people were killed or tortured. This event was the starting point of many other issues which took place during Enver Hoxha's dictatorship. Class struggle was strictly applied, human freedom and human rights were denied. The Kelmend region was almost isolated by both the border and by a lack of roads for another 20 years, the institution of agricultural cooperatives brought about economic decline. Many Kelmendi people fled, some were executed trying to cross the border. Enver Hoxha served as Prime Minister and First Secretary of the Party of Labour of Albania. In the aftermath of World War II and the defeat of Nazi Germany, the country became initially a satellite state of the Soviet Union and Enver Hoxha emerged consequently as the leader of the newly established People's Republic of Albania. Soviet-Albanian relations began to deteriorate after Stalin's death in 1953. At this point, the country started to develop foreign relations with other communist countries among others with the People's Republic of China. During this period, the country experienced an increasing industrialisation and urbanization, a rapid collectivisation and economic growth which led to a higher standard of living. The government called for the development of infrastructure and most notably the introduction of a railway system that completely revamped transportation. The new land reform laws were passed granting ownership of the land to the workers and peasants who tilled it. Agriculture became cooperative and production increased significantly, leading to the country's becoming agriculturally self-sufficient. In the field of education, illiteracy was eliminated among the country's adult population. The government also oversaw the emancipation of women and the expansion of healthcare and education throughout the country. The average annual increase in the country's national income was 29% and 56% higher than the world and European average, respectively. [not in citation given]. The nation incurred large debts initially with Yugoslavia until 1948, then the Soviet Union until 1961 and China from the middle of the 1950s. The constitution of the communist regime did not allow taxes on individuals, instead, taxes were imposed on cooperatives and other organizations, with much the same effect. 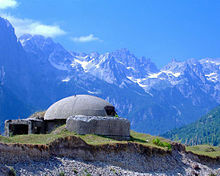 A bunker overlooking the Albanian Alps. By 1983, approximately 173,371 concrete bunkers were counted across the country. Today a secular state without any official religion, religious freedoms and practices were severely curtailed during the communist era with all forms of worship being outlawed. In 1945, the Agrarian Reform Law meant that large swaths of property owned by religious groups were nationalized, mostly the waqfs along with the estates of mosques, tekkes, monasteries and dioceses. Many believers, along with the ulema and many priests, were arrested and executed. In 1949, a new Decree on Religious Communities required that all their activities be sanctioned by the state alone. After hundreds of mosques and dozens of Islamic libraries, containing priceless manuscripts were destroyed, Hoxha proclaimed Albania the world's first atheist state in 1967. The churches had not been spared either, and many were converted into cultural centers for young people. A 1967 law banned all fascist, religious, warmongerish, antisocialist activity and propaganda. Preaching religion carried a three to ten-year prison sentence. Nonetheless, many Albanians continued to practice their beliefs secretly. 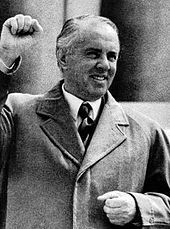 The anti-religious policy of Hoxha attained its most fundamental legal and political expression a decade later: "The state recognizes no religion", states the 1976 constitution, "and supports and carries out atheistic propaganda in order to implant a scientific materialistic world outlook in people". In 1988, people were allowed to walk into the Skanderbeg Square of Tirana. After forty years of communism and isolation as well as the revolutions of 1989, people and most notably students started to become politically active and consequently to campaign against the government that led to the transformation of the existing order. Following the popular support in the first multi-party elections of 1991, the communists retained a stronghold in the parliament until the victory in the general elections of 1992 led by the Democratic Party. Considerable economic and financial resources have been devoted to the Ponzi pyramid schemes that were widely supported by the government. The schemes swept up somewhere between one sixth and one third of the population of the country. Despite the warnings of the International Monetary Fund, his excellency Sali Berisha defended the schemes as large investment firms, leading more people to redirect their remittances and sell their homes and cattle for cash to deposit in the schemes. The schemes began to collapse in late 1996, leading many of the investors to join initially peaceful protests against the government, requesting their money back. The protests turned violent in February 1997 as government forces responded with fire. In March, the Police and Republican Guard deserted, leaving their armories open. These were promptly emptied by militias and criminal gangs. The resulting crisis caused a wave of evacuations of foreign nationals and refugees. The crisis led both Aleksandër Meksi and Sali Berisha to resign from office in the wake of the general election. In April 1997, Operation Alba, a UN peacekeeping force led by Italy, entered the country with two goals exclusively to assist with the evacuation of expatriates and to secure the ground for international organizations. The main international organization, that was involved, was the Western European Union's multinational Albanian Police element, which worked with the government to restructure the judicial system and simultaneously the Albanian Police. Mimi Kodheli was the first female to serve as the Defence Minister of Albania. When the communist system collapsed in 1990, Albania rediscovered foreign policy after decades of isolationism and began to develop closer ties considerably with other countries of Western Europe and the United States. At this point, its top foreign policy ambition was achieving integration into modern economic and security organizations. Previously a member of the Warsaw Pact, the newly established democratic country broadly pursued an integrationist agenda in becoming a member of the NATO. The organisation invited Albania and Croatia to join the alliance at the 2008 Bucharest summit. In April 2014, it became a full member of the organisation and was among the first Southeast European countries to join the partnership for peace programme. Albania applied to join the European Union, becoming an official candidate for accession to the European Union in June 2014. Although Albania received candidate status for the European Union membership in 2014 (based on its 2009 application), the European Union has twice rejected full membership. The European Parliament warned the Government leaders in early 2017 that the 2017 parliamentary elections in June must be free and fair before negotiations could begin to admit the country into the union. On 23 June 2013, the eighth parliamentary elections took place, won by Edi Rama of the Socialist Party. During his tenure as Prime Minister, Albania has implemented numerous reforms focused on the modernizing the economy and democratizing of state institutions inclusively the judiciary and law enforcement of the country. Unemployment has been steadily reduced ranking 4th in terms of lowest unemployment rate in the Balkans. Rama has placed gender equality at the center of its agenda, since 2017 almost 50% of the ministers are female, making it the largest number of women serving in the country's history. 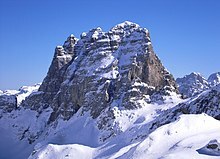 The Albanian Alps are an extension of the Dinaric Alps. Albania is defined in an area of 28,748 square kilometres (11,100 square miles) and located on the Balkan Peninsula in South and Southeast Europe. Its coastline faces the Adriatic Sea to the northwest and the Ionian Sea to the southwest within the Mediterranean Sea. The country lies mostly between latitudes 42° and 39° N, and longitudes 21° and 19° E. Its northernmost point is Vërmosh at 42° 35' 34" northern latitude; the southernmost is Konispol at 39° 40' 0" northern latitude; the westernmost point is Sazan Island at 19° 16' 50" eastern longitude; and the easternmost point is Vërnik at 21° 1' 26" eastern longitude. The highest point of the country is Mount Korab at 2,764 metres (9,068.24 ft) above the Adriatic. The lowest point is the Adriatic Sea at 0 metres (0.00 ft). The distance from the east to west is only 148 kilometres (92 mi), while from the north to south about 340 kilometres (211 mi). Gjipe is located on the confluence of the Adriatic and Ionian Sea. For a small country, much of Albania rises into mountains and hills that run in different directions across the length and breadth of the country. The most extensive mountain ranges are the Albanian Alps in the north, the Korab Mountains in the east, the Pindus Mountains in the southeast, the Ceraunian Mountains in the southwest and the Skanderbeg Mountains in the center. One of the most remarkable features about the country is the presence of numerous important lakes. The Lake of Shkodër is the largest lake in Southern Europe and located in northwest. In the southeast rises the Lake of Ohrid that is one of the oldest continuously existing lakes in the world. Further south extend the Large and Small Lake of Prespa that are among the highest positioned lakes in the Balkans. Rivers originate mostly in the east of Albania and discharge into the Adriatic Sea in the west. The longest river in the country, measured from its mouth to its source, is probably the Drin that starts at the confluence of its two headwaters, the Black and White Drin. Though of particular concern is the Vjosë that represents one of the last intact large river systems in Europe. The Albanian Riviera in the south has a mediterranean climate. The climate in the country is highly variable and diverse owing to the differences in latitude, longitude and altitude. Albania experiences predominantly a mediterranean and continental climate, with four distinct seasons. Defined by the Köppen classification, it accommodates five major climatic types ranging from mediterranean and subtropical in the western half to oceanic, continental and subarctic in the eastern half of Albania. The warmest areas of the country are immediately located along the Adriatic and Ionian Sea Coasts. On the contrary, the coldest areas are positioned within the northern and eastern highlands. The mean monthly temperature ranges between −1 °C (30 °F) in winter to 21.8 °C (71.2 °F) in summer. The highest temperature of 43.9 °C (111.0 °F) was recorded in Kuçovë on 18 July 1973. The lowest temperature of −29 °C (−20 °F) was registered in the village of Shtyllë, Librazhd on 9 January 2017. The Albanian Alps in the north enjoy a subarctic climate. Rainfall varies from season to season and from year to year. The country receives most of precipitation in winter months and less in summer months. The average precipitation is about 1,485 millimetres (58.5 inches). The mean annual precipitation ranges between 600 millimetres (24 inches) and 3,000 millimetres (120 inches) depending on geographical location. The northwestern and southeastern highlands receive the higher amount of precipitation, whilst the northeastern and southwestern highlands as well as the western lowlands the smaller amount. The Albanian Alps in the far north of the country are considered to be among the wettest regions of Europe receiving at least 3,100 mm (122.0 in) of rain annually. An expedition from the University of Colorado discovered four glaciers within these mountains at a relatively low altitude of 2,000 metres (6,600 ft), which is almost unique for such a southerly latitude. Snowfall occurs regularly in winter in the highlands of the country, particularly on the mountains in the north and east, including the Albanian Alps and Korab Mountains. Moreover, snow also falls on the coastal areas in the southwest almost every winter such as in the Ceraunian Mountains, where it can lie even beyond March. The golden eagle is the national symbol and animal of Albania. A biodiversity hotspot, Albania possesses an exceptionally rich and contrasting biodiversity thanks to its geographical location at the center of the Mediterranean Sea and the great diversity in its climatic, geological and hydrological conditions. Its biodiversity is conserved in 14 national parks, 1 marine park, 4 ramsar sites, 1 biosphere reserve and 786 protected areas of different categories. Due to remoteness, the mountains and hills are endowed with forests, trees and grasses that are essential to the lives for a wide variety of animals among other for two of the most iconic endangered species of the country, the lynx and brown bear, as well as the wildcat, gray wolf, red fox, golden jackal and last but not least for the egyptian vulture and golden eagle, the national animal of the country. The estuaries, wetlands and lakes are particularly important for the greater flamingo, pygmy cormorant and the extremely rare and perhaps the most iconic bird of the country, the dalmatian pelican. Of particular importance are the mediterranean monk seal, loggerhead sea turtle and green sea turtle that use to nest on the country's coastal waters and shores. The Karaburun-Sazan Marine Park has a coastline on the Adriatic and Ionian Sea. In terms of phytogeography, Albania is part of the Boreal Kingdom and stretches specifically within the Illyrian province of the Circumboreal and Mediterranean Region. Its territory can be conventionally subdivided into four terrestrial ecoregions of the Palearctic ecozone inclusively the Illyrian deciduous forests, Balkan mixed forests, Pindus Mountains mixed forests and Dinaric Mountains mixed forests. Approximately 3,500 different species of plants can be found in Albania which refer mostly to a Mediterranean and Eurasian character. The country has a rich tradition of herbal and medicinal practices. At least 300 plants growing locally are used in the preparation of herbs and medicines. The trees within the forests are mostly made up of fir, oak, beech and pine. In the 2010 Environmental Performance Index, Albania was ranked 23rd out of 163 countries in the world. In 2012, the country advanced from 23rd to 15th, whereas it had the highest ranking in South and Eastern Europe and Central Asia. The country was the 24th greenest country in the world according to the 2005 Environmental Sustainability Index. Nevertheless, for 2016, the country was ranked the 13th best performing country on the Happy Planet Index by the United Nations. The sovereign state of Albania is a unitary state defined in a total area of 28,748 square kilometres (11,100 square miles). It is apportioned into 12 counties each with their own council and administration. The counties are the country's primary administrative divisions and further subdivided into 61 municipalities. They are responsible for geographical, economic, social and cultural purposes inside the counties. The counties were created on 31 July 2000 to replace the 36 former districts. The government introduced the new administrative divisions to be implemented in 2015, whereby municipalities were reduced to 61, while the rurals were abolished. The defunct municipalities are known as neighborhoods or villages. There are overall 2980 villages or communities in the entire country, formerly known as localities. The municipalities are the first level of local governance, responsible for local needs and law enforcement. The largest county in Albania, by population, is Tirana County with over 800,000 people followed by Fier County with over 300,000 people. The smallest county, by population, is Gjirokastër County with over 70,000 people. The largest in the county, by area, is Korçë County encompassing 3,711 square kilometres (1,433 sq mi) of the southeast of Albania followed by Shkodër County with 3,562 square kilometres (1,375 sq mi) in the northwest of Albania. The smallest county, by area, is Durrës County with an area of 766 square kilometres (296 sq mi) in the west of Albania. Kryeministria, the official workplace of the Prime Minister of Albania located in Tirana. Albania is a parliamentary constitutional republic and sovereign state whose politics operate under a framework laid out in the constitution wherein the president functions as the head of state and the prime minister as the head of government. The sovereignty is vested in the Albanian people and exercised by the Albanian people through their representatives or directly. The government is based on the separation and balancing of powers among the legislative, judiciary and executive. The legislative power is held by the parliament and is elected every four years by a system of party-list proportional representation by the Albanian people on the basis of free, equal, universal and periodic suffrage by secret ballot. The civil law, codified and based on the Napoleonic Code, is divided between courts with regular civil and criminal jurisdiction and administrative courts. The judicial power is vested in the supreme court, constitutional court, appeal court and administrative court. Law enforcement in the country is primarily the responsibility of the Albanian Police, the main and largest state law enforcement agency. It carries out nearly all general police duties including criminal investigation, patrol activity, traffic policing and border control. The executive power is exercised by the president and prime minister whereby the power of the president is very limited. The president is the commander-in-chief of the military and the representative of the unity of the Albanian people. The tenure of the president depends on the confidence of the parliament and is elected for a five-year term by the parliament by a majority of three-fifths of all its members. The prime minister, appointed by the president and approved by the parliament, is authorized to constitute the cabinet. The cabinet is composed primarily of the prime minister inclusively its deputies and ministers. Assisted by the governments of Kosovo and Albania, an official application for the inclusion of the Arbëreshës in the list of UNESCO Intangible Cultural Heritage is being prepared. In the time since the end of communism and isolationism, Albania has extended its responsibilities and position in continental and international affairs, developing and establishing friendly relations with other countries around the world. Its main objectives are the accession into the European Union, the international recognition of Kosovo and the expulsion of Cham Albanians as well as helping and protecting the rights of the Albanians in Kosovo, Montenegro, North Macedonia, Greece, Serbia, Italy and Diaspora. The admission of Albania into the North Atlantic Treaty Organization was considered by Albanian politicians as a primary ambition for the country. The country has been extensively engaged with the organization and has maintained its position as a stability factor and a strong ally of the United States and European Union in the troubled and divided region of the Balkans. Albania and Kosovo are culturally, socially and economically very closely rooted due to the Albanian majority population in Kosovo. In 1998, the country contributed in supporting allied efforts to end the humanitarian tragedy in Kosovo and secure the peace after the NATO bombing of Yugoslavia. Albania enjoys friendly and close ties with the United States ever after it supported the country's independence and its democracy. In present day, the two countries have maintained close economic and defense relations and have signed a number of agreements and treaties. In 2007, Albania welcomed George W. Bush who became the first President of the United States ever to visit the country. Albania has been an active member of the United Nations since 1955. They country took on membership for the United Nations Economic and Social Council from 2005 to 2007 as well as in 2012. It served as vice president of the ECOSOC in 2006 and 2013. In 2014, it also joined the United Nations Human Rights Council from 2015 to 2017 and was elected vice president in 2015. Albania is a full member of numerous international organizations inclusively the Council of Europe, International Organization for Migration, World Health Organization, Union for the Mediterranean, Organisation of Islamic Cooperation, Organization for Security and Cooperation in Europe, International Monetary Fund, World Trade Organization and La Francophonie. Albanian soldiers in the Province of Kandahar, Afghanistan. The Albanian Armed Forces consist of Land, Air and Naval Forces and constitute the military and paramilitary forces of the country. They are led by a commander-in-chief under the supervision of the Ministry of Defense and by the President as the supreme commander during wartime however, in times of peace its powers are executed through the Prime Minister and the Defence Minister. The chief purpose of the armed forces of Albania is the defence of the independence, the sovereignty and the territorial integrity of the country, as well as the participation in humanitarian, combat, non-combat and peace support operations. Military service is voluntary since 2010 with the age of 19 being the legal minimum age for the duty. Albania reduced the number of active troops from 65,000 in 1988 to 14,500 in 2009. The military now consists mainly of a small fleet of aircraft and sea vessels. In the 1990s, the country scrapped enormous amounts of obsolete hardware from China, such as tanks and SAM systems. Increasing the military budget was one of the most important conditions for NATO integration. Military spending has generally been low. As of 1996 military spending was an estimated 1.5% of the country's GDP, only to peak in 2009 at 2% and fall again to 1.5%. Tirana is the economic hub of the country. It is home to major domestic and foreign companies operating in the country. The transition from a socialist planned economy to a capitalist mixed economy in Albania has been largely successful. The country has a developing mixed economy classified by the World Bank as an upper-middle income economy. In 2016, it had the 4th lowest unemployment rate in the Balkans with an estimated value of 14.7%. Its largest trading partners are Italy, Greece, China, Spain, Kosovo and the United States. The lek (ALL) is the country's currency and is pegged at approximately 132,51 lek per euro. The cities of Tirana and Durrës constitute the economic and financial heart of Albania due to their high population, modern infrastructure and strategic geographical location. The country's most important infrastructure facilities take course through both of the cities, connecting the north to the south as well as the west to the east. Among the largest companies are the petroleum Taçi Oil, Albpetrol, ARMO and Kastrati, the mineral AlbChrome, the cement Antea, the investment BALFIN Group and the technology Albtelecom, Vodafone, Telekom Albania and others. In 2012, Albania's GDP per capita stood at 30% of the European Union average, while GDP (PPP) per capita was 35%. Albania were one of three countries in Europe to record an economic growth in the first quarter of 2010 after the global financial crisis. The International Monetary Fund predicted 2.6% growth for Albania in 2010 and 3.2% in 2011. According to the Forbes as of December 2016[update], the Gross Domestic Product (GDP) was growing at 2.8%. The country had a trade balance of −9.7% and unemployment rate of 14.7%. The Foreign direct investment has increased significantly in recent years as the government has embarked on an ambitious program to improve the business climate through fiscal and legislative reforms. The economy is expected to expand in the near term, driven by a recovery in consumption and robust investments. Growth is projected to be 3.2% in 2016, 3.5% in 2017, and 3.8% in 2018. 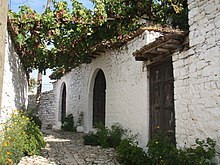 Grapes in Berat. Due to the mediterranean climate, wine, olives and citrus fruits are mostly produced in Southern Albania. Albania has one of Europe's longest histories of viticulture. The today's region was one of the few places where vine was naturally grown during the ice age. The oldest found seeds in the region are 4,000 to 6,000 years old. In 2009, the nation produced an estimated 17,500 tonnes of wine. During the communist era, the production area expanded to some 20,000 hectares (49,000 acres). The secondary sector of Albania have undergone many changes and diversification, since the collapse of the communist regime in the country. It is very diversified, from electronics, manufacturing, textiles, to food, cement, mining, and energy. The Antea Cement plant in Fushë-Krujë is considered as one of the largest industrial greenfield investments in the country. Albanian oil and gas is represents of the most promising albeit strictly regulated sectors of its economy. Albania has the second largest oil deposits in the Balkan peninsula after Romania, and the largest oil reserves in Europe. The Albpetrol company is owned by the Albanian state and monitors the state petroleum agreements in the country. The textile industry has seen an extensive expansion by approaching companies from the European Union (EU) in Albania. According to the Institute of Statistics (INSTAT) as of 2016[update], the textile production marked an annual growth of 5.3% and an annual turnover of around 1.5 billion euros. The Islands of Ksamil in the south of the Albanian Ionian Sea Coast. The tertiary sector represents the fastest growing sector of the country's economy. 36% of the population work in the service sector which contributes to 65% of the country's GDP. Ever since the end of the 20th century, the banking industry is a major component of the tertiary sector and remains in good conditions overall due to privatization and the commendable monetary policy. Previously one of the most isolated and controlled countries in the world, telecommunication industry represents nowadays another major contributor to the sector. It developed largely through privatization and subsequent investment by both domestic and foreign investors. Eagle, Vodafone and Telekom Albania are the leading telecommunications service providers in the country. Tourism is recognised as an industry of national importance and has been steadily increasing since the beginnings of the 21st century. It directly accounted for 8.4% of GDP in 2016 though including indirect contributions pushes the proportion to 26%. In the same year, the country received approximately 4.74 million visitors mostly from across Europe and the United States as well. The narrow gorges and high rocks of Lake of Koman, within the Albanian Alps, remind sometimes of the Scandinavian fjords. The increase of foreign visitors has been dramatic. Albania had only 500,000 visitors in 2005, while in 2012 had an estimated 4.2 million, an increase of 740 percent in only 7 years. In 2015, tourism in summer increased by 25 percent in contrast the previous year according to the country's tourism agency. In 2011, Lonely Planet named as a top travel destination,[not in citation given] while The New York Times placed Albania as number 4 global touristic destination in 2014. The bulk of the tourist industry is concentrated along the Adriatic and Ionian Sea in the west of the country. However, the Albanian Riviera in the southwest has the most scenic and pristine beaches, and is often called the pearl of the Albanian coast. Its coastline has a considerable length of 446 kilometres (277 miles). The coast has a particular character because it is rich in varieties of virgin beaches, capes, coves, covered bays, lagoons, small gravel beaches, sea caves and many landforms. Some parts of this seaside are very clean ecologically, which represent in this prospective unexplored areas, which are very rare within the Mediterranean. Other attractions include the mountainous areas such as the Albanian Alps, Ceraunian Mountains and Korab Mountains but also the historical cities of Berat, Durrës, Gjirokastër, Sarandë, Shkodër and Korçë. The A1 connects the Adriatic Sea in the southwest with the Albanian Alps in the northeast. Transportation in Albania has undergone significant changes and improvements in the past two decades. Improvements to the public transport, road and rail infrastructure, water and air travel have all led to a vast improvement in transportation. The international airport of Tirana serves as the premier gateway to the country and carries almost 2.5 million passengers per year with connections to many destinations in different countries around Europe. The country plans to increase the number of airports especially in the south with possible locations in Sarandë, Gjirokastër and Vlorë. Tirana International Airport is named in honour of the Albanian nun and missionary Mother Teresa. The roads of Albania are well maintained and still under construction. The A1 is the longest motorway of the country and represents a major transportation corridor in Albania. It will prospectively link Durrës on the Adriatic Sea across Pristina in Kosovo with the Pan-European Corridor X in Serbia. The A2 is part of the Adriatic–Ionian Corridor as well as the Pan-European Corridor VIII and connects Fier with Vlorë. The A3 is currently under construction and will connect, after its completion, Tirana and Elbasan with the Pan-European Corridor VIII. When all three corridors are completed, Albania will have an estimated 759 kilometres (472 mi) of highway linking it with all of its neighboring countries. The highly advantageous location of Durrës makes its port the busiest in Albania and among the largest in the Adriatic Sea. Durrës is the busiest and largest seaport in the country followed by Vlorë, Shëngjin and Sarandë. As of 2014[update], it is as one of the largest passenger ports on the Adriatic Sea with annual passenger volume of approximately 1.5 million. The ports serve a system of ferries connecting numerous islands and coastal cities in Croatia, Greece and Italy. The rail network is administered by the national railway company Hekurudha Shqiptare which was extensively promoted by the dictator Enver Hoxha. There has been a considerable increase in car ownership and bus usage while rail use decreased since the end of communism. However a new railway line from Tirana and its airport to Durrës is currently planned. The location of this railway, connecting the most populated urban areas in Albania, makes it an important economic development project. The University of Arts is the largest higher education institute dedicated to the study of arts. In the country, education is secular, free, compulsory and based on three levels of education which is segmented in primary, secondary and tertiary education. The academic year is apportioned into two semesters beginning in September or October and ending in June or July. The use of the Albanian language serves as the primary language of instruction in all educational institutions across the country. Compulsory primary education is divided into two levels, elementary and secondary school, from grade one to five and six to nine, respectively. Pupils are required to attend school from the age of six until they turn 16. Upon successful completion of primary education, all pupils are entitled to attend high schools with specializing in any particular field including arts, sports, languages, sciences or technology. The country's tertiary education, an optional stage of formal learning following secondary education, has undergone a thorough reformation and restructuring in compliance with the principles of the Bologna Process. There is a significant number of private and public institutions of higher education well dispersed in the major cities of Albania. Studies in tertiary education are organized at three successive levels which include bachelor, master and doctorate. The study of a first foreign language is mandatory and are taught most often at elementary and bilingual schools. The languages which are taught in schools are English, Italian, French and German. The country has a school life expectancy of 16 years and a literacy rate of 98.7%, with 99.2% for males and 98.3% for females. Lake Koman was formed as a result of the construction of the Koman Hydroelectric Power Station in 1985. Albania is mostly dependent on hydroelectricity. Almost 94.8% of the country's electricity consumption comes from hydroelectrical stations and ranks 7th in the world by percentage. There are six hydroelectric power stations, including Fierza, Koman, Skavica and Vau i Dejës situated within the Drin River. Further, there are two stations under construction, namely Banjë and Moglicë located in the Devoll River. Both are expected to be completed between 2016 and 2018. In 2015, 498 kilometres (309 mi) of natural gas pipelines and 249 kilometres (155 mi) of oil pipelines spanned the country's territory. The planned Trans Adriatic Pipeline, a major trans Adriatic Sea gas pipeline, will delivers natural gas from Azerbaijan to Albania and Western Europe through Italy and will be completed in 2020. In 1938, King Zog and Queen Geraldine launched Radio Televizioni Shqiptar. The Albanian cuisine, which is characterized by the use of fruits, vegetables and olive oil, contributes to the good nutrition of the country's population. The constitution of Albania guarantees equal, free and universal health care for all its citizens. The health care system of the country is currently organized in three levels, among others primary, secondary and tertiary healthcare, and is in a process of modernisation and development. The life expectancy at birth in Albania is at 77.8 years and ranks 37th in the world outperforming several developed countries. The average healthy life expectancy is at 68.8 years and ranks as well 37th in the world. The country's infant mortality rate is estimated at 12 per 1,000 live births in 2015. In 2000, the country had the 55th best healthcare performance in the world, as defined by the World Health Organization. Cardiovascular disease is the principal cause of death in the country accounting 52% of total deaths. Accidents, injuries, malignant and respiratory diseases are other major causes of death. Neuropsychiatric disease has increased also due to recent demographic, social and economic changes in the country. In 2009, the country had a fruit and vegetable supply of 886 grams per capita per day, the fifth highest supply in Europe. In comparison to other developed and developing countries, Albania has a relatively low rate of obesity probably thanks to the health benefits of the Mediterranean diet. According to World Health Organisation data from 2016, 21.7% of adults in the country are clinically obese, with a Body Mass Index (BMI) score of 25 or more. The explanation for the recent population decrease is the fall of communism in Albania. It was marked by large economic mass emigration from Albania to Greece, Italy and the United States. 40 years of isolation from the world, combined with its disastrous economic, social and political situation, had caused this exodus. The external migration was prohibited outright during the communist era, while internal migration was quite limited, hence this was a new phenomenon. At least, 900,000 people left Albania during this period, about 600,000 of them settling in Greece. The migration affected the country's internal population distribution. It decreased particularly in the north and south, while it increased in the center within the cities of Tirana and Durrës. According to the Institute of Statistics (INSTAT) as of 1 January 2015[update], the population of Albania is 2,893,005. The country's largest urban areas by population as of 2011[update]. Albania recognizes nine national or cultural minorities: Greek, Macedonian, Wallachian, Montenegrin, Serb, Roma, Egyptian, Bosnian and Bulgarian peoples. Other Albanian minorities are Gorani, Aromanians and Jews. Regarding the Greeks, "it is difficult to know how many Greeks there are in Albania". The estimates vary between 60,000 and 300,000 ethnic Greeks in Albania. According to Ian Jeffries, most of Western sources put the number at around 200,000. The 300,000 mark is supported by Greek government as well. The CIA World Factbook estimates the Greek minority at 0.9% of the total population. The US State Department uses 1.17% for Greeks and 0.23% for other minorities. The latter questions the validity of the census data about the Greek minority, due to the fact that measurements have been affected by boycott. Greek representatives form part of the Albanian parliament and the government has invited Albanian Greeks to register, as the only way to improve their status. On the other hand, nationalists, various organizations and political parties in Albania have expressed their concern that the census might artificially increase the numbers of the Greek minority, which might be then exploited by Greece to threaten Albania's territorial integrity. Regions with a traditional presence of ethnic groups other than Albanian. Distribution of ethnic groups within Albania, as of the 2011 census. Districts colored gray are those where a majority of people did not declare an ethnicity (the question was optional). The census was criticized and boycotted by minorities in Albania. Traditional locations of linguistic and religious communities in Albania. Greek is the second most-spoken language in the country, with 0.5 to 3% of the population speaking it as first language, and with two-thirds of mainly Albanian families having at least one member that speaks Greek, most having learned it in the post communist era (1992–present) due to private schools or migration to Greece. Outside of the small designated "minority area" in the south the teaching of Greek was banned during the communist era. As of 2003 Greek is offered at over 100 private tutoring centers all over Albania and at a private school in Tirana, the first of its kind outside Greece. In recent years, the shrinking number of pupils in schools dedicated to the Greek minority has caused problems for teachers. The Greek language is spoken by an important percentage in the southern part of the country, due to cultural and economic links with adjacent Greece. In a 2017 study carried out by Instat, the Albanian government statistical agency, 39.9% of the 25–64 years old is able to use at least one foreign language, with English first at 40.0%, followed by Italian with 27.8% and Greek with 22.9%. Among young people aged 25 or less, English, German and Turkish have seen a rising interest after 2000. Italian and French have had a stable interest, while Greek has lost most of the interest. The trends are linked with cultural and economic factors. The Great Mosque of Durrës. Islam is the majority faith and arrived mostly during the Ottoman period. Albania is a secular state without an official religion, with the freedom of religion being a constitutional right. The 2011 census, for the first time since 1930, included an optional open-ended question on religion; the census recorded a majority of Muslims (58.79%), which include Sunni (56.70%) and Bektashi Muslims (2.09%). Christians, making up 16.92% of the population, include Catholics (10.03%), Orthodox (6.75%) and evangelical Protestants (0.14%).Atheists accounted for 2.5% of the population and 5.49% were non-affiliated believers, while 13.79% preferred not to answer. The preliminary results of the 2011 census seemed to give widely different results, with 70% of respondents refusing to declare belief in any of the listed faiths. The Albanian Orthodox Church officially refused to recognize the results, claiming that 24% of the total population adhered to its faith. Some Muslim Community officials expressed unhappiness with the data claiming that many Muslims were not counted and that the number of adherents numbered some 70% of the Albanian population. The Albanian Catholic Bishops Conference also cast doubts on the census, complaining that many of its believers were not contacted. The Muslim Albanians are spread throughout the country. Orthodox and Bektashis are mostly found in the south, whereas Catholics mainly live in the north. In 2008, there were 694 Catholic churches and 425 orthodox churches, 568 mosques and 70 bektashi tekkes in the country. The Resurrection Cathedral of Tirana is the third largest Orthodox church in Europe. Eastern orthodoxy was first introduced during the Roman period. Religious tolerance is one of the most important values of the tradition of the Albanians. It is widely accepted that Albanians generally value a peaceful coexistence among the believers of different religious communities in the country. During an official visit in Tirana, Pope Francis hailed Albania as model of religious harmony, due to the long tradition of religious coexistence and tolerance. The country is ranked among the least religious countries in the world. Furthermore, religion plays an important role in the lives of only 39% of the country's population. In the WIN/Gallup International Report of 2016, 56% of the Albanian people considered themselves religious, 30% considered themselves non-religious, while 9% defined themselves as convinced atheists; 80% believed in God and 40% believed in life after death. However, 40% believed in hell, while 42% believed in heaven. During classical times, there are thought to have been about seventy Christian families in Durrës, as early as the time of the Apostles. The Archbishopric of Durrës was purportedly founded by Paul the Apostle, while preaching in Illyria and Epirus. Meanwhile, in medieval times, the Albanian people first appeared within historical records from the Byzantines. At this point, they were mostly Christianized. Islam arrived for the first time in the late 9th century to the region, when Arabs raided parts of the eastern banks of the Adriatic Sea. It later emerged as the majority religion, during the centuries of Ottoman Period, though a significant Christian minority remained. During modern times, the Albanian republican, monarchic and later communist regimes followed a systematic policy of separating religion from official functions and cultural life. The country has never had an official religion either as a republic or as a kingdom. The Monastery of Rubik was constructed between 1166. In the 20th century, the clergy of all faiths was weakened under the monarchy and ultimately eradicated during the 1950s and 1960s, under the state policy of obliterating all organized religion from the territories of Albania. The communist regime persecuted and suppressed religious observance and institutions and entirely banned religion. The country was then officially declared to be the world's first atheist state. Although, the country's religious freedom has returned, since the end of communism. Islam survived communist era persecution and reemerged in the modern era as a practiced religion in Albania. Some smaller Christian sects in Albania include Evangelicals and several Protestant communities including Seventh-day Adventist Church, Church of Jesus Christ of Latter-day Saints and Jehovah's Witnesses. The first recorded Protestant of Albania was Said Toptani, who traveled around Europe and returned to Tirana in 1853, where he preached Protestantism. Due to that, he was arrested and imprisoned by the Ottoman authorities in 1864. First evangelical Protestants appeared in the 19th century and the Evangelical Alliance was founded in 1892. Nowadays, it has 160 member congregations from different Protestant denominations. Albania was the only country in Europe where the Jewish population increased significantly during the Holocaust. Following the mass emigration to Israel, since the fall of communism, only 200 Albanian Jews are left in the country. The national flower of Albania is the red poppy and is found everywhere throughout the landscapes of the country. The flag of Albania is a red flag with a black double-headed eagle in the centre. The red colour symbolizes the bravery, strength and valour of the Albanian people and the black colour appears as a symbol of freedom and heroism. The eagle has been used by Albanians since the Middle Ages including the establishment of the Principality of Arbër and by numerous noble ruling families such as the Kastrioti, Muzaka, Thopia and Dukagjini. Gjergj Kastrioti Skënderbeu, who fought and began a rebellion against the Ottoman Empire which halted Ottoman advance into Europe for nearly 25 years, placed the double-headed eagle on his flag and seal. Scampis are one of the favoured dishes among the Albanians on the Albanian Adriatic and Ionian Coasts. 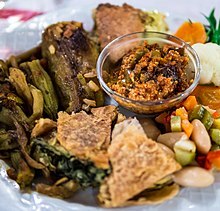 In the course of the centuries, Albanian cuisine has been widely influenced by the culture, geography and history of Albania and therefore different parts of the country have a specific regional cuisine. The cooking traditions vary especially between the north and the south owing to differing topography and climate that contribute to the excellent growth conditions for a wide array of herbs, fruits and vegetables. Albanians produces and uses many varieties of fruits such as lemons, oranges, figs and most notably olives which are perhaps the most important element of Albanian cooking. Spices and other herbs such as basil, lavender, mint, oregano, rosemary and thyme are widely used, as are vegetables such as garlics, onions, peppers, potatoes and tomatoes as well as legumes of all types. Roasted peppers served with Pite, a traditional and prominent layered Albanian pie. While having a coastline along the Adriatic and Ionian Sea of the Mediterranean Sea, fish, crustaceans and seafood are a popular and an integral part of the Albanian diet. Otherwise lamb is the traditional meat for different holidays and religious festivals for both Christians and Muslims, and poultry, beef, and pork are also in plentiful supply. Tavë Kosi is a national dish in Albania and consists of garlicky lamb and rice baked under a thick, tart veil of yogurt. Fërgesë is another national dish in the country and is made up with peppers, tomatoes and cottage cheese. Another beloved dish is Pite which is generally a filled and baked pastry with a filling of a mixture of spinach and gjizë or mish as it is known in Albania. Bukë Misri is a staple on the Albanian table. Petulla, a traditionally fried dough, is as well a popular speciality and is served with powdered sugar or feta cheese and different sorts of fruit jams. Also popular is Flia consisting of multiple crepe-like layers brushed with cream and served with sour cream. Krofne, similar to Berliner, are filled with jam, or chocolate and often eaten during the cold winter months. Coffee is very much a part of the people's lifestyle in Albania. Different variations of coffee is best enjoyed within the family or friends but also outside at cafés or bars. A small country in size, Albania ranked first with the most coffee houses per capita in the world. Tea is enjoyed both at home or outside at cafés, bars or restaurants. Çaj Mali is enormously beloved and is part of a daily routine for most of the Albanians. It is cultivated across Southern Albania and noted for its medicinal properties. Black tea with a slice of lemon and sugar, milk or honey is also a popular type of tea. Wine drinking is popular throughout the Albanians. The country has a long and ancient history of wine production, as it belongs to the old world of wine producing countries. Its wine is characterized for its sweet taste and traditionally indigenous varieties. Butrint has been included in the UNESCO list of World Heritage Sites since 1992. The architecture of Albania reflects the legacy of various civilizations tracing back to the classical antiquity. Major cities in Albania have evolved from within the castle to include dwellings, religious and commercial structures, with constant redesigning of town squares and evolution of building techniques. Nowadays, the cities and towns reflect a whole spectrum of various architectural styles. In the 20th century, many historical as well as sacred buildings bearing the ancient influence were demolished during the communist era. Ancient architecture is found throughout Albania and most visible in Byllis, Amantia, Phoenice, Apollonia, Butrint, Antigonia, Shkodër and Durrës. Considering the long period of rule of the Byzantine Empire, they introduced castles, citadels, churches and monasteries with spectacular wealth of visible murals and frescos. Perhaps the best known examples can be found in the southern Albanian cities and surroundings of Korçë, Berat, Voskopojë and Gjirokastër. Involving the introduction of Ottoman architecture there was a development of mosques and other Islamic buildings, particularly seen in Berat and Gjirokastër. The Fortress of Bashtovë is on the tentative list for inscribing it as a UNESCO World Heritage Site. Socialist classicism arrived during the communist era in Albania after the Second World War. At this period many socialist-styled complexes, wide roads and factories were constructed, while town squares were redesigned and numerous of historic and important buildings demolished. Notable examples of that style include the Mother Teresa Square, Pyramid of Tirana, Palace of Congresses and so on. Two Albanian archaeological sites are included in the list of UNESCO World Heritage Sites. These include the ancient remains of Butrint and the medieval Historic Centres of Berat and Gjirokastër. Furthermore, the natural and cultural heritage of Ohrid, the royal Illyrian tombs, the remains of Apollonia, the ancient Amphitheatre of Durrës and the Fortress of Bashtovë has been included on the tentative list of Albania. The Albanian iso-polyphony is UNESCO's Masterpiece of the Oral and Intangible Heritage of Humanity. Nowadays, Tirana is the most important center of visual arts in Albania. The cultural renaissance was first of all expressed through the development of the Albanian language in the area of church texts and publications, mainly of the Catholic region in the northern of Albania, but also of the Orthodox in the south. The Protestant reforms invigorated hopes for the development of the local language and literary tradition, when cleric Gjon Buzuku brought into the Albanian language the Catholic liturgy, trying to do for the Albanian language, what Martin Luther did for the German language. Meshari (The Missal) written by Gjon Buzuku was published in 1555 and is considered as one of the first literary work of written Albanian during the Middle Ages. The refined level of the language and the stabilised orthography must be the result of an earlier tradition of written Albanian, a tradition that is not well understood. However, there is some fragmented evidence, pre-dating Buzuku, which indicates that Albanian was written from at least the 14th century. The earliest evidence dates from 1332 AD with a Latin report from the French Dominican Guillelmus Adae, Archbishop of Antivari, who wrote that Albanians used Latin letters in their books although their language was quite different from Latin. Other significant examples include: a baptism formula (Unte paghesont premenit Atit et Birit et spertit senit) from 1462, written in Albanian within a Latin text by the Bishop of Durrës, Pal Engjëlli; a glossary of Albanian words of 1497 by Arnold von Harff, a German who had travelled through Albania, and a 15th-century fragment of the Bible from the Gospel of Matthew, also in Albanian, but written in Greek letters. Albanian-American actress Eliza Dushku produced the documentary Dear Albania with a crew from Travel Channel and Lonely Planet, promoting tourism in Albania. The Albania national football team, ranking 51st in the World in 2017 (highest 22nd on 22 August 2015) have won the 1946 Balkan Cup and the Malta Rothmans International Tournament 2000, but had never participated in any major UEFA or FIFA tournament, until UEFA Euro 2016, Albania's first ever appearance at the continental tournament and at a major men's football tournament. Albania scored their first ever goal in a major tournament and secured their first ever win in European Championship when they beat Romania by 1–0 in a UEFA Euro 2016 match on 19 June 2016. The most successful football clubs in the country are Skënderbeu, KF Tirana, Dinamo Tirana, Partizani and Vllaznia. Historically, the Albanian people have established several communities in many regions throughout Southern Europe. The Albanian diaspora has been formed since the late Middle Ages, when they emigrated to places such as Italy, especially in Sicily and Calabria, and Greece to escape either various socio-political difficulties or the Ottoman conquest of Albania. Following the fall of communism, large numbers of Albanians have migrated to countries such as Australia, Canada, France, Germany, Greece, Italy, Scandinavia, Switzerland, United Kingdom and the United States. Albanian minorities are present in the neighboring territories such as the west of North Macedonia, the east of Montenegro, Kosovo in its entirety and southern Serbia. In Kosovo, Albanians make up the largest ethnic group in the country. Altogether, the number of ethnic Albanian living abroad its territory is estimated to be higher than the total population inside the territory of Albania. ^ "404". Archived from the original on 14 October 2017. Retrieved 6 January 2018. ^ a b c "Population and Housing Census 2011". INSTAT (Albanian Institute of Statistics). Archived from the original on 3 August 2017. ^ "Income Gini coefficient". World Bank. UNDP. Archived from the original on 23 July 2010. Retrieved 3 July 2015. ^ a b "Human Development Report 2018" (PDF). United Nations. 2018. Retrieved 15 September 2018. ^ Giacomo Jungg (1 January 1895). Fialuur i voghel scc...p e ltinisct mle...un prei P. Jak Junkut t' Scocniis ... N'Sckoder t' Scc...pniis. Retrieved 23 July 2016 – via Internet Archive. ^ a b "Albania". The World Factbook. Central Intelligence Agency. Retrieved 21 June 2013. ^ Zolo, D. (27 August 2002). Invoking Humanity: War, Law and Global Order. Continuum International Publishing Group. p. 180. ISBN 9780826456564 – via Google Books. ^ "The world bank". World Bank. Archived from the original on 21 September 2014. Retrieved 13 September 2014. ^ "Albania applies for EU membership". BBC News. 28 April 2009. Archived from the original on 30 April 2009. Retrieved 29 April 2009. ^ Casanova. "Radio-Arberesh.eu". Radio-Arberesh. Retrieved 13 September 2014. ^ Lloshi, Xhevat. "The Albanian Language" (PDF). United Nations Development Programme. Archived from the original (PDF) on 9 July 2011. Retrieved 9 November 2010. ^ a b F. Prendi, "The Prehistory of Albania", The Cambridge Ancient History, 2nd edn., vol. 3, part 1: The Prehistory of the Balkans; and the Middle East and the Aegean World, Tenth to Eighth Centuries B.C., ed. John Boardman et al. (Cambridge: Cambridge UP, 1982), 189–90. ^ Hammond, N. G. L. (1974). Grave circles in Albania and Macedonia. Bronze Age Migrations in the Aegean: Archaeological and Linguistic Problems in Greek Prehistory. 4. British Association for Mycenaean Studies. pp. 189–198. ISBN 978-0-7156-0580-6. Retrieved 16 March 2011. ^ Nicholas Geoffrey Lemprière Hammond. Studies: Further studies on various topics. A.M. Hakkert, 1993, p. 231: "The leading dans of both groups buried their dead under a circular tumulus of soil in the second millennium BC The main reservoir of the Greek speakers was central Albania and Epirus, and it was from there that the founders of Mycenaean civilization came to Mycenae, c. 1600 BC, and buried their nobles in Grave Circle B. Further waves of immigrants passing through and from Epirus people the Greek peninsula and islands the last wave, called Dorians, settling from 1100 onwards. The lands they left in central Albania were occupied during the so-called Dark Age (U10-800BC) by Illyrians, whose main habitat was in the area now called Bosnia,"
^ John Boardman. The prehistory of the Balkans and the Middle East and the Aegean world. Cambridge University Press, 1982. ISBN 978-0-521-22496-3, p. 629: "... the southernmost outliers of the tribes which held the Zeta valley, as such they may have been the immediate neighbours of Greek-speaking tribes in the Bronze Age." ^ Wilkes John. The Illyrians. Wiley-Blackwell, 1995, ISBN 978-0-631-19807-9, p. 92: "Illyrii was once no more than the name of a single people... astride the modern frontier between Albania and Yugoslav Montenegro"
^ Cambridge University Press. The Cambridge ancient history. 2000. ISBN 0-521-23447-6, page 261,"... down to the mouth of Aous"
^ Hammond, Nicholas Geoffrey Lemprière; Walbank, Frank William (1 January 1972). A History of Macedonia: 336–167 B.C. Clarendon Press. ISBN 978-0-19-814815-9. ^ Jackson-Laufer, Guida Myrl (1 January 1999). Women Rulers Throughout the Ages: An Illustrated Guide. ABC-CLIO. pp. 382–383. ISBN 978-1-57607-091-8. ^ The History of Rome. D. Appleton & Company. 1 January 1846. p. 259. ^ Wilkes, John (9 January 1996). The Illyrians. Wiley. p. 189. ISBN 978-0-631-19807-9. ^ Marjeta Šašel Kos, "The Illyrian King Ballaeus – Some Historical Aspects", Épire, Illyrie, Macédoine: Mélanges offerts au professeur Pierre Cabanes, ed. Danièle Berranger (Clermont-Ferrand: Presses Universitaires Blaise Pascal, 2007), 127. ^ a b Zickel, Raymond; Iwaskiw, Walter R., eds. (1994). ""The Barbarian Invasions and the Middle Ages," Albania: A Country Study". Retrieved 9 April 2008. ^ Madgearu, Alexandru; Gordon, Martin (2008). The wars of the Balkan Peninsula: Their medieval origins. Lanham: Scarecrow Press. ISBN 9780810858466. ^ The Genealogist. 1980. p. 40. ^ Pickard, Rob; Çeliku, Florent (2008). Analysis and Reform of Cultural Heritage Policies in South-East Europe. Strasbourg: Council of Europe Publishing. p. 16. ISBN 978-92-871-6265-6. ^ Norris, H. T. (1993). Islam in the Balkans: religion and society between Europe and the Arab world. University of South Carolina Press. p. 35. ISBN 978-0-87249-977-5. ^ Pipa, Arshi; Repishti, Sami (1984). Studies on Kosova. East European Monographs #155. pp. 7–8. ISBN 978-0-88033-047-3. ^ Etleva, Lala (2008). Regnum Albaniae, the Papal Curia, and the Western Visions of a Borderline Nobility (PDF). Cambridge University Press. ^ Gjonça, Arjan (2001). Communism, Health and Lifestyle: The Paradox of Mortality Transition in Albania, 1950–1990. Greenwood Publishing Group. pp. 7–. ISBN 978-0-313-31586-2. ^ Norris, H. T. (1993). Islam in the Balkans: religion and society between Europe and the Arab world. University of South Carolina Press. p. 196. ISBN 978-0-87249-977-5. ^ "Albania :: The decline of Byzantium". Encyclopædia Britannica. Retrieved 13 September 2014. ^ a b c Clayer, Nathalie (2012). "Albania" in Encyclopaedia of Islam, Gudrun Krämer, Denis Matringe, Rokovet, John Nawas, Everett Rowson (eds.). Brill Online. ^ Observator Cultural. "Dor de Dunăre şi alte nostalgii cosmopolite". observatorcultural.ro (in Romanian). ^ Kopecek, Michal; Ersoy, Ahmed; Gorni, Maciej; Kechriotis, Vangelis; Manchev, Boyan; Trencsenyi, Balazs; Turda, Marius (2006), Discourses of collective identity in Central and Southeast Europe (1770–1945), 1, Budapest, Hungary: Central European University Press, p. 348, ISBN 978-963-7326-52-3, retrieved 18 January 2011, The position of the League in the beginning was based on religious solidarity. It was even called Komiteti i Myslimanëve të Vërtetë (The Committee of the Real Muslims) ... decisions are taken and supported mostly by landlords and people closely connected with Ottoman administration and religious authorities..
^ "Albanian League". Encyclopædia Britannica. Retrieved 5 January 2012. ^ Giaro, Tomasz (2007). "The Albanian legal and constitutional system between the World Wars". Modernisierung durch Transfer zwischen den Weltkriegen. Frankfurt am Main, Germany: Vittorio Klosterman GmbH. p. 185. ISBN 978-3-465-04017-0. Retrieved 24 January 2011. From its own members congress elected a senate (Pleqësi), composed of 18 members, which assumed advisory role to the government. ^ Giaro, Tomasz (2007). "The Albanian legal and constitutional system between the World Wars". Modernisierung durch Transfer zwischen den Weltkriegen. Frankfurt am Main, Germany: Vittorio Klosterman GmbH. p. 185. ISBN 978-3-465-04017-0. Retrieved 24 January 2011. a provisional government, consisting of ten members and led by Vlora, was formed on 4 December. ^ Elsie, Robert. "1913 The Conference of London". Archived from the original on 11 February 2011. Retrieved 5 January 2012. ^ Zaharia, Perikli (24 March 2003). "The post – 1989 constitutional course of south east Europe". Athens: Centre for European Constitutional Law. Archived from the original on 22 January 2011. Retrieved 22 January 2011. ^ Elsie, Robert. "Albania under prince Wied". Archived from the original on 25 January 2011. Retrieved 25 January 2011. pro-Ottoman forces ... were opposed to the increasing Western influence ... In November 1913, these forces, ... had offered the vacant Albanian throne to General Izzet Pasha ... War Minister who was of Albanian origin. ^ Bowden, William (2003). Epirus Vetus : the archaeology of a late antique province. London: Duckworth. p. 28. ISBN 978-0-7156-3116-4. the Greek Epirote population of the area refused to be incorporated into the new Albanian state and in February 1914 declared the Autonomous Republic of Northern Epirus ... in 1921 Albania was recognised as an independent sovereign state, with its borders established on their present lines. ^ ed, Gregory C. Ference (1994). Chronology of 20th century eastern European history. Detroit [u.a. ]: Gale Research. p. 9. ISBN 978-0-8103-8879-6. February 28 George Zographos, a former foreign minister of Greece, proclaims at Gjirokaster the establishment of the Autonomous Republic of Northern Epirus, with Zographos as president. He notifies the International Commission that his government has been established because the Great Powers have not provided the Greeks in southern Albania any guarantees for the protection of the life, property and religious freedom, and ethnic existence. ^ Vickers, Miranda (1999). The Albanians: a modern history. I.B. Tauris. p. 81. ISBN 978-1-86064-541-9. He gathered round him a group of discontented Muslim priests ... and proclaimed himself the savior of Albania and the Champion of Islam. ^ Springer, Elisabeth; Leopold Kammerhofer (1993). Archiv und Forschung. Oldenbourg Wissenschaftsverlag. p. 346. ISBN 978-3-486-55989-7. ^ Vickers, Miranda (1 January 1999). The Albanians: A Modern History. I.B. Tauris. p. 118. ISBN 978-1-86064-541-9. ^ Vickers, Miranda (1 January 1999). The Albanians: A Modern History. I.B. Tauris. ISBN 978-1-86064-541-9. ^ "BESA: A CODE OF HONOR Muslim Albanians Who Rescued Jews During the Holocaust". Yad Vashem. ^ Bogdani, Mirela; Loughlin, John (15 March 2007). Albania and the European Union: The Tumultuous Journey Towards Integration and Accession. I.B. Tauris. p. 230. ISBN 978-1-84511-308-7. ^ Edwin E. Jacques (1995). The Albanians: An Ethnic History from Prehistoric Times to the Present. McFarland, 1995. p. 431. ISBN 9780899509327. Retrieved 15 February 2014. ^ Zef Pllumi (2008). Live to Tell: A True Story of Religious Persecution in Communist Albania. iUniverse. ISBN 9780595452989. Retrieved 15 February 2014. ^ a b c "Albanian Nationalism". Encyclopædia Britannica. Encyclopædia Britannica. Retrieved 22 November 2016. ^ "Envery Hoxha". Encyclopædia Britannica. Encyclopædia Britannica. Retrieved 22 November 2016. ^ Qori, Arlind (22 February 2019). "From Faculty to Factory". Jacobin. Retrieved 14 March 2019. ^ Dalakoglou, Dimitris (2012). "The Road from Capitalism to Capitalism". Mobilities. 7 (4): 571–586. doi:10.1080/17450101.2012.718939. Retrieved 11 November 2012. ^ Prybyla, Jan S. (1 January 1969). Comparative Economic Systems. Ardent Media. pp. 294–. ISBN 9780390719003. ^ Pano, Aristotel. "Panorama of the Economic-Social Development of Socialist Albania". Retrieved 11 April 2012. ^ "Hapet dosja, ja harta e bunkerëve dhe tuneleve sekretë". ^ Kombësia dhe feja në Shqipëri, 1920–1944 / Roberto Morocco dela Roka; e përktheu nga origjinali Luan Omari. ^ a b Elsie, Robert (2010). Historical Dictionary of Albania. Historical Dictionaries of Europe, No. 75 (2nd ed.). Lanham, MD, and Plymouth: The Scarecrow Press. p. 27. ISBN 978-0-8108-6188-6. ^ "Report: The Elections in Albania". 27 May 2016. ^ Jarvis, Christopher (2000). "The Rise and Fall of the Albanian Pyramid Schemes". Finance and Development. 37 (1): 1. ^ Bezemer, Dirk (2001). "Post-socialist Financial Fragility: The Case of Albania". Cambridge Journal of Economics. 25 (1): 1–25. doi:10.1093/cje/25.1.1. hdl:10419/85494. JSTOR 23599718. ^ Musaraj, Smoki (2011). "Tales from Albarado: The Materiality of Pyramid Schemes in Post-socialist Albania". Cultural Anthropology. 26 (1): 84–110. doi:10.1111/j.1548-1360.2010.01081.x. ^ For the most part, the Albanian refugees emigrated to Italy, Greece, Switzerland, Germany, or North America. ^ Brandon Burden (December 2016). "NATO's small states: Albania as a case study" (PDF). calhoun.nps.edu. pp. 44–60. ^ "Albania country profile". BBC News. BBC News. 15 December 2016. Retrieved 8 February 2017. The  election was closely monitored by the European Union, which has twice rejected Albania's membership application and warned that the poll would be a crucial test for its further progress towards integration in the bloc. ^ Culbertson, Alix (1 February 2017). "Albania and Bosnia fail to impress at EU membership meeting over democratic value concerns". Express. Retrieved 8 February 2017. Albania and Bosnia have stumbled at the first hurdle of becoming fully-fledged European Union (EU) members after MEPs questioned the credibility of their democratic values. ^ Shqip, Gazeta. "Ahmetaj: Premtimi për 300 mijë vende punë është mbajtur - Gazeta SHQIP Online". gazeta-shqip.com. ^ "PM Rama at "Global Leader Woman" Summit". ambasadat.gov.al. ^ Eftimi, R. "Some Considerations on Seawater-freshwater Relationship in Albanian Coastal Area" (PDF). ITA Consult. ^ "Tregues Sipas Qarqeve Indicators by Prefectures" (PDF). Archived from the original (PDF) on 24 July 2011. Retrieved 12 November 2010. ^ Bolevich, Maria (3 January 2017). "Largest lake in southern Europe under threat from "eco-resort"". newscientist.com. ^ "Natural and Cultural Heritage of the Ohrid region". whc.unesco.org. pp. UNESCO. Situated on the shores of Lake Ohrid, the town of Ohrid is one of the oldest human settlements in Europe; Lake Ohrid is a superlative natural phenomenon, providing refuge for numerous endemic and relict freshwater species of flora and fauna dating from the tertiary period. As a deep and ancient lake of tectonic origin, Lake Ohrid has existed continuously for approximately two to three million years. ^ "Lake Ohrid; Invest in Macedonia – Agency for Foreign Investments of the Republic of Macedonia". InvestInMacedonia.com. Archived from the original on 14 September 2008. Retrieved 3 June 2017. ^ United Nations Economic Commission for Europe. "Environmental Performance Reviews Albania" (PDF). unece.org. p. 30. ^ a b Ministry of Environment of Albania. "The First National Communication of the Republic of Albania to the United Nations Framework Convention on Climate Change (UNFCCC)" (PDF). unfccc.int/. Tirana. pp. 33–34. ^ a b Ministry of Environment of Albania. "Albania's Second National Communication to the Conference of Parties under the United Nations Framework Convention on Climate Change" (PDF). unfccc.int. Tirana. p. 28. ^ a b c d Alban Kuriqi. "Climate and climate change data for Albania" (PDF). drinkadria.fgg.uni-lj.si. Tirana. pp. 3–5. ^ "PERGATITJA E PROFILIT KOMBETAR SHQIPETAR PER TE VLERESUAR STRUKTUREN KOMBETARE NE MENAXHIMIN E KIMIKATEVE DHE ZBATIMIN E UDHEZIMEVE TE SAICM" (PDF). ^ "Moti, regjistrohet temperatura rekord në Shqipëri, - 29 gradë në Librazhd". ^ Hughes, Philip D. (30 November 2009). "Twenty-first Century Glaciers and Climate in the Prokletije Mountains, Albania Journal Arctic, Antarctic, and Alpine Research Publisher Institute of Arctic and Alpine Research, University of Colorado ISSN 1523-0430 (Print) 1938–4246 (Online) Issue Volume 41, Number 4 / November 2009 DOI 10.1657/1938-4246-41.4.455 Pages 455–459 Online Date: 30 November 2009". Arctic, Antarctic, and Alpine Research. 41 (4): 455–459. doi:10.1657/1938-4246-41.4.455. Archived from the original on 7 August 2013. Retrieved 27 August 2010. ^ "Mediterranean Basin Biodiversity Hotspot" (PDF). cepf.net. July 2017. pp. 1–339. ^ "BIODIVERSITY IN ALBANIA REPORT ON NATIONAL SITUATION OF BIODIVERSITY IN ALBANIA" (PDF). macfungi.webs.com. p. 2. ^ "Albania's Biodiversity and Protected Areas An Executive Summary" (PDF). al.undp.org. ^ Ministry of Tourism and Environment. "FIFTH NATIONAL REPORT OF ALBANIA TO THE UNITED NATIONS CONVENTION ON BIOLOGICAL DIVERSITY (CBD)" (PDF). cbd.int. p. 4. ^ UNECE. "Albania Environmental Performance Reviews" (PDF). unece.org. p. 141. ^ "On the status and distribution of the large carnivores (Mammalia: Carnivora) in Albania" (PDF). catsg.org. Tirana. p. 4. ^ "Die potentielle Verbreitung der Wildkatze (Felis silvestris silvestris) in Österreich als Entscheidungsgrundlage für weitere Schutzmaßnahmen" (PDF). wildkatze-in-oesterreich.at (in German). Salzburg. p. 19. ^ Protection and Preservation of Natural Environment in Albania. "Albanian Nature". ppnea.org. Archived from the original on 31 August 2018. Retrieved 4 January 2019. ^ NaturAL. "Albania towards NATURA 2000". natura.al. Tirana. p. 1. 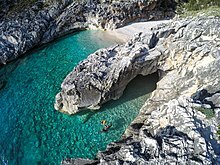 ^ "The National Parks Of Albania The fifteen national parks in Albania encompass an area of 210,668.48 hectares which accounts for about 3.65% of the overall territory of the country". worldatlas.com. The territory of Albania can be divided into four ecoregions: Dinaric Alpine (mixed forests in the far north). Balcanic (mixed forest in the north-east). Pindus mountain (mixed forests covering the central and southeast mountains). Illyrian deciduous (forest covering the rest of the country). ^ Ministry of Environment. "GAP ANALYSIS FOR NATURE PROTECTION LEGAL ACTS ON WILD FAUNA CONSERVATION AND HUNTING (Albania)" (PDF). al.undp.org. pp. 86–99. Archived from the original (PDF) on 14 October 2018. Retrieved 4 January 2019. ^ University of Yale. "2012 Environmental Performance Index" (PDF). wbc-rti.info. p. 11. ^ "2005 Environmental Sustainability Index" (PDF). earth.columbia.edu. p. 3. ^ "Happy Planet Index Score". happyplanetindex.org. ^ Government of Albania. "REFORMA ADMINISTRATIVO-TERRITORIALE" (PDF). parlament.al (in Albanian). p. 8. ^ Fletorja Zyrtare e Republikës së Shqipërisë. "STRATEGJIA NDËRSEKTORIALE PËR DECENTRALIZIMIN DHE QEVERISJEN VENDORE 2015–2020" (PDF). qbz.gov.al (in Albanian). p. 9. ^ "A Brief History of the Administrative-territorial Organization in Albania". reformaterritoriale.al. ^ "Ndarja administrative, njësitë vendore në lagje dhe fshatra". Archived from the original on 25 September 2017. Retrieved 7 December 2018. ^ "Ndarja e re, mbeten 28 bashki, shkrihen komunat – Shekulli Online". Shekulli.com.al. Archived from the original on 13 January 2014. Retrieved 23 July 2016. ^ "Ndarja e re, mbeten 28 bashki, shkrihen komunat | Shekulli Online". Shekulli.com.al. 10 January 2014. Archived from the original on 13 January 2014. Retrieved 15 February 2014. ^ "Reforma Territoriale – KRYESORE". Reformaterritoriale.al. Retrieved 15 August 2014. ^ a b c d "1998 CONSTITUTION OF THE REPUBLIC OF ALBANIA" (PDF). osce.org. pp. 1–3. ^ "LAW Nr. 8436, dated 28 December 1998 ON THE ORGANIZATION OF THE JUDICIAL POWER IN THE REPUBLIC OF ALBANIA" (PDF). osce.org. pp. 1–12. ^ "1998 CONSTITUTION OF THE REPUBLIC OF ALBANIA" (PDF). osce.org. pp. 17–19. ^ "1998 CONSTITUTION OF THE REPUBLIC OF ALBANIA" (PDF). osce.org. pp. 19–21. ^ "Arbëreshët kërkojnë ndihmë nga Tirana (Video)". telegrafi.com (in Albanian). Retrieved 4 April 2017. ^ "U.S. Relations With Albania". state.gov. ^ a b Ministry of Foreign Affairs. "Albania and the United Nations 60 Years of Partnership" (PDF). punetejashtme.gov.al. p. 9. ^ Ministry of Foreign Affairs. "Albania and the United Nations 60 Years of Partnership" (PDF). punetejashtme.gov.al. p. 13. 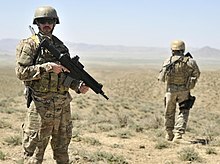 ^ "Albania to end conscription by 2010". wri-irg.org. 22 August 2008. ^ "Albania Military 2017". theodora.com. ^ Ministry of Defence. "Engagement Policy and evidence of AAF participation in PK missions". mod.gov.al. ^ "Albania membership Nato". NATO. Archived from the original on 28 July 2011. ^ "Albania sells off its military hardware". BBC News. 17 April 2002. ^ "Albania to abolish conscription by 2010". SETimes.com. 21 August 2008. Retrieved 29 December 2009. ^ "Albanian military expenditure as % of GDP". World Bank. ^ "Albania". World Diplomacy. Retrieved 1 August 2014. ^ "GDP per capita in purchasing power standards in 2012" (PDF). Eurostat. Archived from the original (PDF) on 27 December 2013. Retrieved 14 December 2013. ^ "Instituti i Statistikave" (PDF). Instituti i Statistikave – Tiranë. Archived from the original (PDF) on 20 December 2016. Retrieved 6 May 2016. ^ "Albanian employment rate increases in agriculture, services sector in Q1 2016". fdi.gov.cn. Retrieved 15 June 2016. ^ "UC Research Reveals One of the Earliest Farming Sites in Europe". University of Cincinnati. 16 April 2012. Archived from the original on 10 September 2015. Retrieved 17 June 2016. ^ "IPA National Programme 2011 for Albania Project Fiche 7: Support to Agriculture and Rural Development" (PDF). ec.europa.eu. ^ Dhimitër Doka. "Albaniens vergessener Exportschlager". humboldt-foundation.de (in German). Retrieved 10 May 2016. ^ "Wine production (tons)". Food and Agriculture Organization. p. 28. Archived from the original on 20 May 2011. Retrieved 18 April 2011. ^ "Manufacturing & garment industry". 1 June 2014. ^ "Mining sector". 1 June 2014. ^ "ANTEA, the company with the highest working standards". anteacement.com. ^ "UPDATE 1-Bankers Petroleum's key Albanian oilfield output jumps in Q1". Reuters. 7 April 2011. ^ "Textile industry in Albania is unprepared for a potential influx of import orders". balkaneu.com. 24 August 2014. ^ Europe Review 2003/04: The Economic and Business Report. 2003. pp. 3–7. ISBN 9780749440671. ^ "Albania – Mining and Minerals". 15 August 2016. ^ "Lonely Planet's top 10 countries for 2011 – travel tips and articles – Lonely Planet". Retrieved 7 August 2013. ^ Sustainable Development of Sea-Corridors and Coastal Waters: The TEN ECOPORT project in South East Europe (Chrysostomos Stylios, Tania Floqi, Jordan Marinski, Leonardo Damiani ed.). Springer. 7 April 2015. p. 85. ISBN 9783319113852. ^ "Coastline | Visit Albania | The Official website of Albanian Tourism". Albania.al. Archived from the original on 9 August 2014. Retrieved 15 August 2014. ^ Tirana Times (17 January 2018). "Turkish consortium bids to build Vlora airport as Albania prepares to launch national carrier". tiranatimes.com. ^ a b South East Europe Transport Observatory (SEETO). "THE CORE TRANSPORT NETWORK South-East Europe Transport Observatory SEETO" (PDF). ec.europa.eu. p. 2. ^ "Serbia and Kosovo Only Beginning to Form Infrastructural Links: Peace Highway to Connect the Region". kossev.info. 15 April 2018. ^ "Hekurudha Tiranë-Rinas-Durrës, Haxhinasto: Projekti përfundon në 2019". top-channel.tv (in Albanian). 25 June 2016. Archived from the original on 28 September 2017. Retrieved 4 January 2019. ^ a b c "LANGUAGE EDUCATION POLICY PROFILE: ALBANIA Country Report" (PDF). rm.coe.int. Tirana. October 2016. ^ a b c "The Albanian education system described and compared with the Dutch system" (PDF). epnuffic.nl. 1 January 2015. ^ "Overview of the Higher Education System Albania" (PDF). eacea.ec.europa.eu. February 2017. pp. 12–16. ^ a b "Language Education Policy Profile 2015 – 2017 ALBANIA" (PDF). rm.coe.int. Tirana. pp. 13–18. ^ "SCHOOL LIFE EXPECTANCY". world.bymap.org. 31 January 2017. ^ "Electricity production from hydroelectric sources (% of total)". ^ a b The World Factbook. "Albania". cia.gov. p. 1. ^ Ministry of Infrastructure and Energy of Albania. "Albania Renewable Energy Progress Reports 2014–2015" (PDF). energy-community.org. p. 2. ^ Energy Information Administration (3 September 2016). "Crude Oil Proved Reserves 2016". eia.gov. p. 1. ^ "Trans Adriatic Pipeline" (PDF). tap-ag.com. Tirana. p. 8. ^ "Albania, Croatia plan nuclear power plant". Balkaninsight.com. Archived from the original on 28 March 2010. Retrieved 27 August 2010. ^ "Research for Development". DFID. Retrieved 13 September 2014. ^ "Strategy of Science, Technology and Innovation 2009–2015" (PDF). Retrieved 27 August 2010. ^ "Radio Tirana's Broadcasting Schedule – RadioTirana.org". Picasaweb.google.es. 25 October 2008. Archived from the original on 17 November 2009. Retrieved 5 May 2013. ^ "Health Care Systems in Transition Albania 2002" (PDF). euro.who.int. p. 17. ^ "1998 CONSTITUTION OF THE REPUBLIC OF ALBANIA" (PDF). osce.org. p. 10. ^ "Albania Demographic and Health Survey 2008-09" (PDF). dhsprogram.com. March 2010. p. 37. ^ "Albania-prel.pmd" (PDF). Archived (PDF) from the original on 27 December 2009. Retrieved 29 December 2009. ^ "Life Expectancy at Birth". CIA – The World Factbook. ^ WHO. "Healthy life expectancy at birth, 2000-2015". gamapserver.who.int. ^ World Health Organization. "Measuring overall health system performance for 191 countries" (PDF). New York University. ^ a b c "Albania Demographic and Health Survey 2008-09" (PDF). dhsprogram.com. March 2010. p. 37. ^ "Nutrition, Physical Activity and Obesity Albania" (PDF). euro.who.int. p. 3. ^ "The World Is Getting Fatter and No One Knows How to Stop It". bloomberg.com. 6 April 2016. ^ "Living Smart, the Mediterranean Way of Being Albanian". agroweb.org. 1 May 2017. ^ a b "Albania". cia.gov. ^ Institute of Statistics of Albania. "Albania Population and Population dynamics new demographic horizons?" (PDF). unstats.un.org. p. 25. ^ Institute of Statistics of Albania. "Albania Population Projections 2011–2031" (PDF). instat.gov.al. p. 37. ^ "Population of Albania 1 January 2016". Republic of Albania Institute of Statistics. Archived from the original on 13 July 2017. Retrieved 29 June 2017. ^ Institute of Statistics of Albania. "Population of Albania 1 January 2017" (PDF). instat.gov.al. Tirana. p. 4. ^ "Popullsia e Shqipërisë" (PDF). Archived from the original (PDF) on 12 April 2016. Retrieved 19 February 2016. ^ "Population". INSTAT. Archived from the original on 16 March 2013. ^ INSTAT. "POPULATION AND HOUSING CENSUS 2011" (PDF). instat.gov.al (in Albanian and English). Archived from the original (PDF) on 30 June 2017. ^ "Third Opinion on Albania adopted on 23 November 2011". Advisory Committee on the Framework for the Protection of National Minorities. Retrieved 29 June 2017. ^ staff (12 October 2017). "Albania has Recognized the Bulgarian Minority in the Country". novinite.com. Sofia News Agency. Retrieved 4 December 2017. ^ United Nations High Commissioner for Refugees (11 May 2005). "World Directory of Minorities and Indigenous Peoples – Albania : Overview". UNHCR. Retrieved 5 May 2013. ^ RFE/RL Research Report: Weekly Analyses from the RFE/RL Research Institute. Radio Free Europe/Radio Liberty, Incorporated. 1993. Retrieved 22 December 2012. Albanian officials alleged that the priest was promoting irredentist sentiments among Albania's Greek minority – estimated at between 60,000 and 300,000. ^ Ian Jeffries (2002). Eastern Europe at the Turn of the Twenty-first Century: A Guide to the Economies in Transition. Routledge. p. 69. ISBN 978-0-415-23671-3. Retrieved 6 September 2013. It is difficult to know how many ethnic Greeks there are in Albania. The Greek government, it is typically claimed, says that there are around 300,000 ethnic Greeks in Albania, but most Western estimates are around the 200,000 mark. ^ "Albania". CIA. Retrieved 13 September 2014. ^ "Albania". U.S. Department of State. Retrieved 13 September 2014. ^ "International Religious Freedom Report for 2014: Albania" (PDF). www.state.gov. United States Department of State. p. 5. Retrieved 20 October 2015. Ethnic Greek minority groups had encouraged their members to boycott the census, affecting measurements of the Greek ethnic minority and membership in the Greek Orthodox Church. ^ "Macedonians and Greeks Join Forces against Albanian Census". balkanchronicle. Archived from the original on 12 January 2012. Retrieved 24 September 2011. ^ "Albania passes census law". MINA. ^ "ÿþMicrosoft Word – Law Nr 10442 date 07.07.2011.doc" (PDF). Archived from the original (PDF) on 9 May 2013. Retrieved 25 March 2013. ^ a b "The politics of numbers and identity in Albania". EUDO Observatory on Citizenship. Archived from the original on 24 February 2013. Retrieved 20 December 2012. ^ Likmeta, Besar. "Albania Nationalist Leader Resigns from Top Justice Job". Balkannsight. Retrieved 7 January 2013. ^ "Some Albanians consider changing nationality for profit". SETimes. ^ "Courts in Albania suspend changing nationality to Greek". SETimes. ^ "Greek Consul Statement Angers Albanian MPs". BalkanInsight. ^ "Languages of Albania". Archived from the original on 23 January 2009. Retrieved 31 October 2010. ^ "What Languages Are Spoken In Albania?". WorldAtlas. ^ "The Second Most Spoken Languages Around the World". Kathimerini. Retrieved 12 June 2017. .5% speak it as first language. ^ a b c "The Greek language is widely spoken in Albania (H Ελληνική γλώσσα γίνεται καθομιλουμένη στην Αλβανία)". Kathimerini. Retrieved 12 June 2017. ^ "Përqëndrimi shkollave të minoritetit dhe kundërshtitë e saj". DW. 2010. ^ Nitsiakos, Vasilēs G. (2011). Balkan Border Crossings: Second Annual of the Konitsa Summer School. LIT Verlag Münster. p. 150. ISBN 9783643800923. in the Albanian south... The Greek language is spoken by an important percentage of the Albanians of the south. ^ "Press release of the Adult Education Survey" (PDF). Albanian Institute of Statistics. 10 May 2018. Retrieved 23 May 2018. ^ Gjovalin Shkurtaj (2017). Urgjenca gjuhësore: -huazime të zëvendësueshme me fjalë shqipe- : (fjalorth). Naimi. pp. 15–16. ISBN 9789928234049. Sic u permend me lart, per shkak te shkaqeve kulturore dhe ekonomike, trendet e mesimit te gjuheve nga te rinjte (grupmosha deri ne 25 vjec) ndryshojne. Keto trende jane percaktues i nje sere fenomeneve shoqerore, sic do te shohim me tej. Keshtu nga viti 2000 e ketej, gjuha angleze, gjermane dhe ajo turke kane pasur nje rritje te interest. Gjuha italiane, por edhe ajo franceze kane pasur nje stabilitet, pra as rritje dhe as ulje te interesit te pergjithshem nga ana e grupmoshes te siperpermendur. Vihet re se gjuha greke ka pesuar nje renie te forte te interesit. Ne fakt, shumica e interesit ka rene per kete gjuhe. Arsyet per kete gjuhe specifike do ti trajtojme me tej ne kapitulin e trete. ^ "Gjuha gjermane, shumë e kërkuar në Shqipëri". albinfo.ch. albinfo. 10 April 2014. Retrieved 26 May 2018. ^ "Në Shqipëri vazhdon të rritet interesi për gjuhën turke". voal.ch. voal. 5 October 2016. Retrieved 26 May 2018. ^ Bledi Mane (17 September 2011). "10 universitetet me cilesore te shqiperise". gazetatema.net. TemA. Retrieved 26 May 2018. ^ "1998 CONSTITUTION OF THE REPUBLIC OF ALBANIA" (PDF). osce.org. p. 2. ^ "Third Opinion on Albania adopted on 23 November 2011". Strasbourg. 4 June 2012. ^ a b "Presentation of the main results of the Census of Population and Housing 2011" (PDF). Archived from the original (PDF) on 26 March 2017. Retrieved 15 August 2014. ^ "Regjistrimi: 70% e banorëve nuk kanë deklaruar besimin fetar". Ateistët. Archived from the original on 8 August 2017. Retrieved 18 April 2012. ^ "Censusi permbys fete, 70 per qind refuzojne ose nuk e deklarojne besimin". Shqiperia.com. Retrieved 30 March 2016. ^ "Kisha Ortodokse Autoqefale e Shqipërisë - Deklaratë zyrtare". Peshku pa uje. Archived from the original on 12 December 2017. Retrieved 11 December 2017. ^ "Kisha Ortodokse: Censusi fshehu 17% të besimtarëve". Shqiptarja.com. Archived from the original on 1 July 2016. Retrieved 23 July 2016. ^ "Fete kunder censusit, bektashinjte: Nuk u pyetem". Panorama. Retrieved 8 December 2017. ^ Jazexhi, Olsi (2013). "Albania". In Nielsen, Jørgen; Akgönül, Samim; Alibašić, Ahmet; Racius, Egdunas (eds.). Yearbook of Muslims in Europe: Volume 5. Leiden: Brill. pp. 21–36. ISBN 9789004255869. "Some officials from the Muslim community of Albania have expressed their unhappiness with the census result, claiming that according to their calculations the percentage of the Muslims was 70%. They have also claimed that many members of the Muslim Community were not counted in the census." ^ "Katolikët kundër Censusit: Do të regjistrojmë besimtarët - Arkiva Shqiptare e Lajmeve". www.arkivalajmeve.com. Retrieved 8 December 2017. ^ "Albania: International Religious Freedom Report 2007". U.S. State Department. 14 September 2007. Archived from the original on 28 August 2010. Retrieved 27 August 2010. ^ "Korrieri online – Shqip". 23 May 2005. Archived from the original on 23 May 2005. Retrieved 17 November 2015. ^ "Në Shqipëri P. ka 1119 kisha dhe 638 xhami". Ateistët. Archived from the original on 18 November 2015. Retrieved 17 November 2015. ^ UNESCO. "Island of Peace: Documentary on Religious Coexistence in Albania". unesco.org. p. 1. Retrieved 22 July 2011. ^ BBC. "The country that's famous for tolerance". bbc.com. p. 1. ^ The Telegraph. "Pope Francis hails Albania as model of religious harmony in attack on religious extremism". telegraph.co.uk. p. 1. ^ "Gallup Global Reports". Gallup. Archived from the original on 14 October 2013. Retrieved 25 March 2013. ^ The Telegraph. "Mapped: The world's most (and least) religious countries". telegraph.co.uk. p. 1. ^ Worldwide Independent Network/Gallup International Association. "Religion prevails in the world" (PDF). wingia.com. p. 4 & 7. Archived from the original (PDF) on 14 November 2017. Retrieved 27 February 2018. ^ "ALBANIA" (PDF). religion-freedom-report.org.uk. p. 2. ^ BERNHARD TONNES. "Religious Persecution in Albania" (PDF). biblicalstudies.org.uk. ^ Jørgen Nielsen; Samim Akgönül; Ahmet Alibašić; Egdunas Racius (2013). "Albania". Yearbook of Muslims in Europe. 5. Leiden, Boston, New York: Brill. p. 23. ISBN 9789004255869. Retrieved 12 March 2016. ^ a b Merdjanova, Ina (2013). Rediscovering the Umma: Muslims in the Balkans between nationalism and transnationalism. Oxford: Oxford University Press. pp. 6–7, 39–40. ISBN 9780190462505. ^ "Albania". TED Adventist. Archived from the original on 24 February 2013. Retrieved 25 March 2013. ^ "Famous British celebrity visits ADRA Albania". 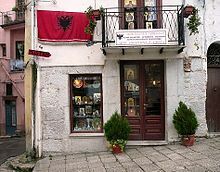 ^ "LDS Newsroom-Country Profile-Albania". The Church of Jesus Christ of Latter-day Saints. Archived from the original on 25 August 2010. ^ "THE ALBANIAN ETHNOTYPE AND THE SAVING OF THE JEWS DURING WAR" (PDF). maximilian-kolbe-stiftung.de. pp. 1–5. ^ "The Rescue of Jews in Albania Through the Perspective of the Yad Vashem Files of the Righteous Among the Nations" (PDF). yadvashem.org. pp. 1–11. ^ "1st chief rabbi inaugurated in Albania – Israel Jewish Scene, Ynetnews". Ynetnews. Retrieved 15 February 2014. ^ Ariel Scheib. "Albania Virtual Jewish Tour". Jewish Virtual Library. Retrieved 15 February 2014. ^ a b Fletorja zyrtare e Republikës së Shqipërisë. "PËR FORMËN DHE PËRMASAT E FLAMURIT KOMBËTAR, PËRMBAJTJEN E HIMNIT KOMBËTAR, FORMËN DHE PËRMASAT E STEMËS SË REPUBLIKËS TË SHQIPËRISË DHE MËNYRËN E PËRDORIMIT TË TYRE" (PDF). qbz.gov.al (in Albanian). Tirana. ^ Historia e popullit shqiptar (in Albanian) (Instituti i Historisë (Akademia e Shkencave e RSH) ed.). Tirana: Botimet Toena, 2002. pp. 294–298, 433–434. ^ Paulist Fathers (1876). Catholic World, Band 23. Paulist Fathers, 1876. p. 235. ^ Francis Tapon (8 December 2011). The Hidden Europe: What Eastern Europeans Can Teach Us. SonicTrek, Inc., 2011. p. 441. ISBN 9780976581222. ^ "Bagëti e Bujqësia (analizë)". letersia.fajtori.com (in Albanian). p. 1. ^ "Why Albania Is A Great Destination For Wine Drinkers". epicureandculture.com. Retrieved 5 January 2017. ^ "Wines of Albania". winesofbalkans.com. p. 1. Archived from the original on 7 January 2014. Retrieved 18 January 2019. ^ Karin Myhrberg - University of Gothenburg. "Heritage from the Communist Period in Albania - An Unwanted Heritage Today?" (PDF). gupea.ub.gu.se. p. 12. ^ UNESCO. "The Castle of Bashtova". whc.unesco.org. ^ UNESCO. "Albanian folk iso-polyphony". ich.unesco.org. ^ "Kujtimet për Koço Çakalin, themeluesin e këngës himariote". shekulli.com.al. Archived from the original on 29 August 2016. Retrieved 23 July 2016. ^ "Era Istrefi requires Albanian citizenship, meets with President Nishani". ocnal. Retrieved 12 November 2016. ^ "How Ermonela Jaho became the world's most acclaimed soprano". The Economist. 28 May 2016. Retrieved 28 May 2016. ^ "Tenori shqiptar Saimir Pirgu nominohet në "Grammy Awards"! (Foto)". Telegrafi. Retrieved 7 December 2016. ^ a b "Robert Elsie: Arti Shqiptar". www.albanianart.net. Retrieved 22 November 2015. ^ "The Thracian language". The Linguist List. Archived from the original on 3 February 2008. Retrieved 27 January 2008. An ancient language of Southern Balkans, belonging to the Satem group of Indo-European. This language is the most likely ancestor of modern Albanian (which is also a Satem language), though the evidence is scanty. 1st Millennium BC – 500 AD. ^ Dushku, Eliza (2 September 2011). "Why You Must Visit Albania". The Huffington Post. Retrieved 11 March 2012. ^ Stafi i Akedemise se Shkencave (2003). Historia e popullit shqiptar. Botimet Toena. p. 252–254. Abrahams, Fred (2015). Modern Albania: From Dictatorship to Democracy in Europe. NYU Press. p. 384. ISBN 978-0-8147-0511-7. "Albania". The World Factbook. Central Intelligence Agency.